Click the button below to download your FREE Conversation Model tip sheet. 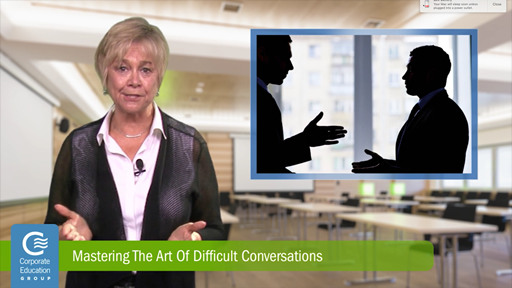 No matter what position you hold in the workplace — VP, director, project manager, associate or team member — you will no doubt be faced with many instances where having a difficult conversation will be necessary. When faced with a difficult conversation, using the following tactics can turn an uncomfortable interaction into a smooth one. Use emotional intelligence. It is important that you control the way you express your emotions and handle interpersonal relationships judiciously and empathetically. Do not allow yourself to be emotionally hijacked. If you’re angry, don’t react aggressively. If you’re sad, refrain from becoming hysterical. Instead, channel these feelings into positive reactions and choices that are driven by rational responses rather than an emotional ones. Using active listening, advocacy skills and positive body language makes all the difference during a tough conversation. By not allowing yourself to use an “I’m right, you’re wrong” mentality, you open yourself up to compromise and also have a better chance of understanding the other person’s point of view. Difficult conversations come in all different forms. Whatever the conversation, use emotional intelligence active listening and maintain positive body language to help you ensure a positive outcome of the discussion.